FRP grating is widely used in chemical industry, paper industry, power plants, sewage treatment plants, food processing plants, smelters, mines, saltworks, nuclear power plants, battery factories, etc., can be used as a walkway, bridge, industrial floor , Operation platform, trench cover, pallet, guardrail, fence, shelf, isolation belt, green walkway, slab walkway slope walkway, tank top, power plant water treatment workshop, drainage cover, manhole cover, sewage treatment plant , Wash the steam room FRP cover, car wash drainage, ski FRP stands, FRP sidewalk, guardrail, subway along the FRP maintenance boardwalk, marina, landscape bridge deck, FRP cable branch, tree protection GRP, municipal green tree street construction Grille, factory operating platform, lawn isolation zone, lawn isolation zone, boat deck and so on. FRP grating in China is still in a strong period of growth. In the early nineties of last century, Chinese did not know the FRP grille to the FRP grille, and the gradual adoption of FRP grille. The advantages of this product are also fully reflected in the harsh corrosive environment. Annual market demand to 10% -20% of the rate of increase, China’s grille production technology, mold manufacturing technology has also leapt to the forefront of the world, product quality comparable with Western developed countries. Each year China grille products out of about 60 – 700000 square meters. Among them, the molding grid about 50 – 600000 square meters, about 50000-80000 square meters of raschel grid. The domestic market demand of about 6 – 80000 square meters. Export sales of about 25 million US dollars in annual sales, domestic sales of about 24 million yuan. Chinese FRP grating manufacturers are mainly located in Jiangsu, Henan, Hebei, Shandong and other places. 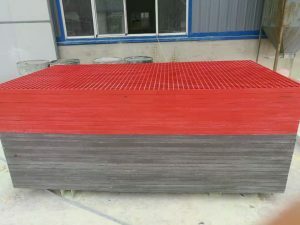 With the national revitalization of related industries planning and increase investment in infrastructure, for the FRP grid industry, the construction and transportation industry is the largest amount of glass fiber (FRP grille, FRP cover production) applications, at the same time Demand for fiberglass in new energy and power industries will also continue to grow. Glass fiber reinforced plastic (GRP, FRP production) reinforced thermoplastic composites more and more attention, the FRTP market is expected to have substantial growth in recent years. According to the development of FRP grating industry in our country, it is estimated that the demand for fiberglass in recent years will have double-digit annual growth.